The Great Network is an ancient web of routes and gates, where sentient trains can take you anywhere in the galaxy in the blink of an eye. Zen Starling is a nobody. A petty thief from the filthy streets of Thunder City who aimlessly rides the rails of the Network. So when the mysterious stranger Raven offers Zen a chance to escape the squalor of the city and live the rest of his days in luxury, Zen can't believe his luck. All he has to do is steal one small box from the Emperor's train with the help of Nova, an android girl. But the Great Network is a hazardous mess of twists and turns, and that little box just might bring everything in this galaxy ― and the next ― to the end of the line. 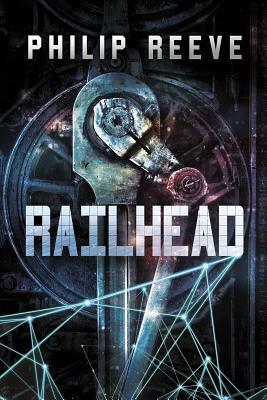 The highly anticipated novel from Carnegie-medal-winning author Philip Reeve, Railhead is a fast, immersive, and heart-pounding ride perfect for any sci-fi fan. Step aboard ― the universe is waiting.